With a couple of days away from the computer and internet, I had a chance to “read a book”. Better stated, listen to a book as it was read to me while flying from Atlantic City to Florida and back. I have been to a number of presentations around my home state, where Megan was speaking, as her stories are awesome, and how she discovered the stories. I am also honored to be able to call her a friend. A couple of times I was able to call her up or email her and see if she “wanted a cup of coffee”. I have had the book for a while, bought a couple for friends, and had it on my phone in Audiobook format, so I listened. Not changing subject, but what really caught my attention, early in the book, what her references to relationships to some famous people and how they related to each other. When I listened to the list of characters I was reminded of the We’re Related APP that I have blogged about before. Many, of the names there were mentioned have appeared in the We’re Related APP for me. Now, I have seen a number of very negative comments about the usefulness of the APP, but I have experienced some ideas and hints for where I might look for my own research. What was in the book, that I hadn’t realized earlier, is why these famous persons might be related, but that also lead to why I may be related to some of these folk. Colonial Ancestry. Well, I knew that I have that in my tree, but more specifically, many of the folks mentioned was Irish Ancestry. I have very few Irish Ancestors in my current database, that I have more or less proven, but not to the amount that my DNA Results show. When I say my DNA Ethnicity Estimate of 27% Ireland / Scotland / Wales really had to listen. Just the fact that she may have been involved with some, if not all, of the research on these famous folk allows me to thing more positively about the “famous persons” “line” that was presented in the APP. As I may have mentioned before, I am using the We’re Related APP Data as an “undocumented” source of information, BUT, I have documented using my DNA Results for my side of the data from the APP. While entered the APP Data, I looked at my exiting working database to see how many profiles from the APP were already in my existing database. Using my existing database and the Shared Matches from the DNA results, I have identified a number of people who do not have an online tree, or a private online tree, based on those shared DNA Matches. A project that I have been wanted to do, was to merge the We’re Related APP Database with my Master (working) File. By re-reading this book, I am in the process of preparing for that merging of this 2,500 person database, into my 9,000 person database. That includes bringing my Master Database up to my “new standards” of how I do research and more specifically, how I document my research. Features that were not in much earlier versions of my program and using some of the new features and are in the same program now AND skills, tips, and tricks that I have learned along the way. Maybe a visit to Megan’s Website, http://www.megansmolenyak.com/ will inspire you, as it does me. Her blog, video’s, Newsletter are must reading for me. Re-reading what I already have, or listening to the book, has encouraged me to get back to my own research, reminding myself that this We’re Related APP work was NOT a waste of time, and maybe, I will get a better understanding about the 27% DNA Estimate is all about. Haven’t posted a status recently on my We’re Related APP Project. I am actively taking the “new’ APP Cousin’s and entering them into my We’re Related EXCEL Spreadsheet, into my genealogy database and syncing it to an Ancestry Member Tree. I have 125 APP Cousins. 73 of which are Facebook Friends, 52 are the Famous folk, including 9 Presidents and 1 First Lady. 12 have been proven to be Half Cousins, where we had one common ancestor, but a different spouse. 4 Have NO Direct Relationship. They appear to have been two people with the same name and birth years, but after evaluating the data, proved to not have a direct relationship. I found 5 where the relationship was with the Spouse of the APP Cousin. There have been 2 deaths in the Tree since the project started and a Birth. If interest to me, is that I already had 32 of the 125 Common Ancestors in my database, with another 15 within 1 generation. Those 15 are the first to be put into my existing database after I return from RootsTech2017. Early Maryland, Early New England ancestors, for the first two, Johnston is one where I have a not well researched ancestor, and the Cheyney’s are early Pennsylvania, but I apparently haven’t done as much research on them at I should have. But I now have more information to work with. 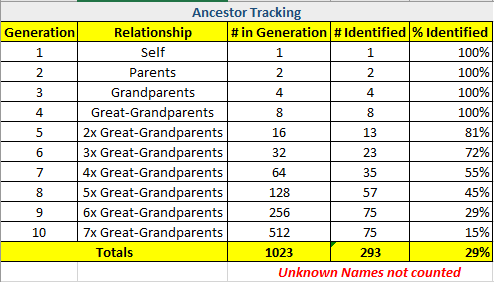 The next step is to take that 1 Generation short list and but my APP data into my master file and work with the hints that I have already seen from the Ancestry Shaky Leaf Hints. Saturday Night Genealogy Fun – What’s Your Ancestral Name Number? About 25% of the first 10 generations. I decided to see what my We’re Related Database looks like, all from the APP. I am now almost at 30%. This along means that I may be able to added these additional people to the database. But, in reality, I actually have pushed back to more generations in my research. 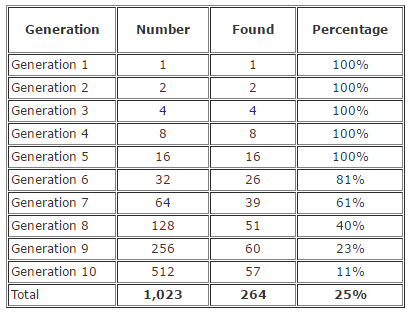 Of course, the percentage doesn’t look very good, but it would be adding about 100 direct line Ancestors. There is a note at the bottom of the chart that says “Unknown Names not counted”. I have those profiles in my database, may know a little about them, just don’t know their name. Mostly spouses of a person whose name I do know. I am working a cleaning up my APP database before I take the APP data in enter it into my Master database. I was going to merge the APP Data into my Master database, but I think I am just going to hand enter the data, the same way I did in the APP Database. That forces me to really look at the data. I have developed some tools within my database that I want to implement into my Master database based on this exercise. Sorry, have been quiet recently, but still working on the We’re Related project. I think I may have had a break through on someone of interest in my database, but could not figure out where he fit in. But that’s for another Blog Post. My notes and earlier findings, along with the APP has given me some information to research. I have 107 APP Cousins in my database and I have done some analysis that I want to share so far. Looking at the Common Ancestors from the APP, I have 30 of them in my existing database. Because I was tracking which of my Grandparents the Common Ancestor was part of “that line”, it didn’t surprise me which Line I have done the most research on, what were involved with the APP cousins. This comes after the data is in my database and the evaluation of the relations is review with the program I use. The 5 issue that I have identified are problems with a relationship around the Common Ancestor. For example: A second spouse, where I come down from one spouse and the APP Cousin was from the 2nd spouse. I have been able to identify that the APP cousin was really the spouse of the APP Cousin. The 4 with “other issues” are ones where I need to revisit the data entry and and APP data. 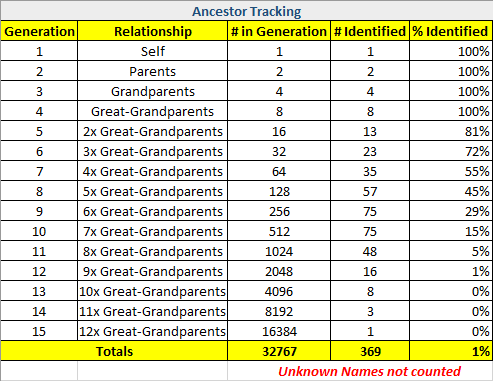 In addition to the 30, I have 15 more, where I am one generation short of the Common Ancestor in my existing database. 2 more Half Cousins appear and the Spouse of another Half Cousin. 2 need a little more research. Based on my experience with the Hints, it would appear that the data isn’t too bad. From what I have experienced with hints, the Relationships, Dates, and Places increase the number of hints. The ones that I have followed or just looked at, they appear to be good hints to follow. Of the 45 profiles mentioned above, 30 of them are Facebook Friends. 5 of my non-Facebook Friends are among the group where the Common Ancestor is already in my database and I haven’t found any issues with yet. Clearly having Colonial New England and Maryland ancestors have helped these numbers. 5th Cousin 1x Removed to 9th Cousin 1x Removed are in the list of 45 people. We’re Related APP–So where are we ? I am caught up, at least until yesterday, with my data entry and analysis. For what ever that is worth. The One Generation Short means that I have the descendant of the Common Ancestor in my existing database. My next step is to fill that gap for my existing database. I guess I was pleasantly surprised at the number of Common Ancestors that I already had in my database, or was only a generation short. It sort of is confirmation, to me, that my database is close. BUT, the Source of “my line” in the APP, is my own data. I can tell that by the number of times certain of my direct line ancestors appear in the APP. When I go back to researching my own ancestors, I will focus on the results of the APP. The Bad News is that I have one APP Cousin, where the APP has a several hundred year gap. I have 1 APP Cousin where I am a 1/2 Cousin, due to a 2nd marriage. I have 2 APP Cousin’s where I am related to the Spouse, and 3 APP Cousins that I have disproven. I have been tracking, based on my Grandparents, where the APP Cousins fit in. ALL 4 Grandparents are represented, not necessarily equally, but are represented. Two of my grandparents were from Colonial Pennsylvania and that was about 40 of the Common Ancestors. Colonial New England Ancestors are 24, and the other 26 were Colonial Maryland. 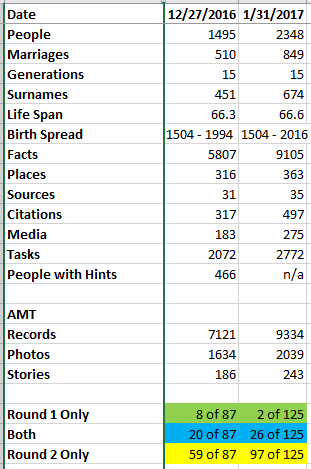 My APP Database has 1,738 people in it, and I just checked the Hints in the Ancestry Member Tree and there are 8,117 Record Hints, 1,950 Photos, and 206 Stories. So there is plenty or records to prove or disprove this database. I do not plan on use that database, but to return to my existing database, using the experience of this project to firm up my own research. Looking at the Hints, there are many, many records that I have not seen before, with some records allowing me to get “across the pond” more frequently, because I am seeing those U.K. records in the hints. I continue to think that the We’re Related APP is a Tool to help me expand my research. Actually, perhaps that is to Focus my research. Bottom line here, I think this 2 month project has been worthwhile, for me at least, but attempting to evaluate this APP as a research tool. Can’t wait to get back to my own research. Lots of work going on. But thought that I would stop for a moment and give an update. The numbers below are from a hand count, so they may be off a little. I thought it that it was interesting as to how many of the Common Ancestors were in my existing database. Now, this has to be taken with a grain of salt, as to My Line, in the APP is probably my own data. But at the same time, there are possibly 205 new direct line ancestors to research for. Of the 91 APP Cousins, 45 of them are Facebook Friends. All four of my Grandparents have been represented. Colonial New England, Colonial Maryland, Pennsylvania and New Jersey in my existing database is what is capturing these APP cousins. None of this is proven, not sure that it will be proven in this file, but is certainly opening up some resources that have not been available in the past. It trying to validate the APP Data, I am seeing lots of new and great databases that I have not seen before. Also, some Family History Books are bringing hints to the database. Of the 1,662 people in the database, there are 7,628 Record hints, 1,866 Photo Hints, and 197 Story Hints on Ancestry.com. Lesson Learned: So Many Hints, So Little Time.